Here is a program with the LED that turns on smoothly while the button is pressed. To make a smooth transition from 0 to 1 and vice versa we use the fade node from the XOD standard library. It transforms its output value toward the target value with the rate specified. In some cases this node helps to reduce bouncing or power bursts. For example, when you rotate a motor without smooth acceleration, it can cause a voltage drop and whole device reboot. 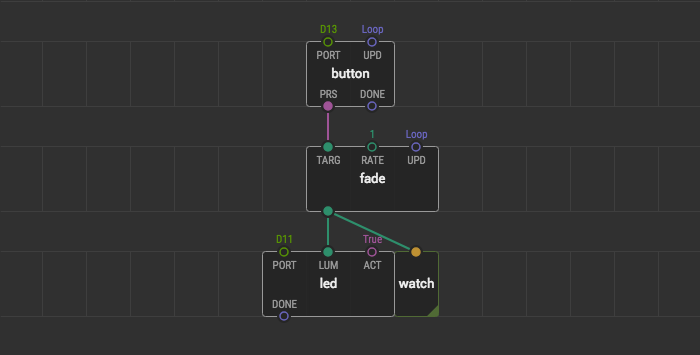 Test the fade node with servo. Add a servo next to led and link it with fade too. Bind 2.0 to the RATE pin to get a faster transition. Press and hold the button a few times. Observe how fade smoothens the transition and changes the direction if the re-targeted in the middle of the process. Remove the fade node, link to button directly, and take a look at the board. When the motor starts moving you can see board LEDs are dimming; the board even can reboot.